When setting up a new quadcopter/drone, it is important to match your transmitter endpoints with the flight controller endpoints but this can be a frustrating process. Fortunately there is a largely undocumented feature which might help. Endpoints and Midpoints are important for ensuring that you get the most out of your quadcopter/drone, to verify these settings you need to connect to the flight controller via USB and open up either CleanFlight or BetaFlight. Also ensure that you have a battery connected to the quadcopter and your transmitter turned on. Once connected, take a look at the ‘Receiver’ tab and it is likely that you will discover that your channels are not mapped correctly to the outputs of your transmitter. When moving your transmitter gimbals (sticks) around whilst watching the figures shown live, the numerical value when the gimbals are at their lowest levels should read 1000, the highest should read 2000. For sprung gimbals such as roll, pitch and yaw, the midpoint values when you release the gimbal should be 1500. It is not important to set these values for switch inputs such as AUX1 – AUX4 as these are not generally proportional controls/inputs. If your figures do not match the above recommended figures then you will need to make some adjustments as follows. If only minor adjustment is required (e.g. for values 1020-1997) then you can make the necessary changes by editing the model tab ‘OUTPUTS/SERVOS’ and adjusting the values shown to change the minimum, maximum and sub-trim value. Changes to these values should be made whilst watching the live value reflected on the flight controller via CleanFlight/BetaFlight. You may find that your transmitter does not allow you to exceed a certain value when adjusting sub-trims, the FrSky Taranis X9D has an inbuilt limiter which can be set per model. To alter this, edit the model settings and enable the ‘Extended Limits’ and ‘Extended Trims’ setting, then reattempt the sub-trim adjustment. If the values shown in CleanFlight or BetaFlight are dramatically different to the recommended values of 1000-2000 (e.g. 1078-1926) then you can use a command via the flight controller CLI (Command Line Interface) to align the values with the output from the transmitter. 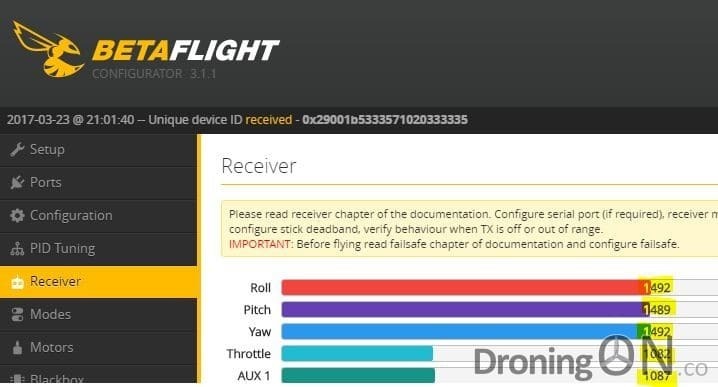 This feature is documented in the BetaFlight FAQs but there are very few practical examples of how to utilise this useful command. Here are the steps to use the ‘rxrange’ command. 1. For each of the primary 1-4 channels shown in CleanFlight or BetaFlight, note the lowest and highest figures – for my setup, the lowest was 1087, the highest was 1926. 2. Click on the ‘CLI’ tab and type in ‘rxrange’, then press ‘Return’ – this will show you the current values configured. 4. Repeat step 3 for each of the three remaining channels, pressing ‘Return’ after entering each line. 5. Finally, type in ‘Save’ and press ‘Return’, this will submit the configuration and then reboot the flight controller. 6. Once rebooted, click on the ‘Receiver’ tab and use the gimbals once again to show the lowest and highest numerical values. They should now read 1000 and 2000 respectively. 7. It might be necessary now to use the transmitter sub-trim features (as described in the first section of this article) to fine-tune the top and bottom values, as well as to correct the Mid-Point value which must be set to 1500. We hope that this guide is useful, please feel free to comment below with any corrections or omissions. Special thanks to Austin McClure to giving us the pointer to this useful command. Be sure to join the DroningON Discussion Group for the latest in news, reviews, exclusives and interviews from the drone and quadcopter industry.